L: 96" x W: 40.5" x H: 38"
Chatwick Sofa Whether you’re a traditionalist or love a trendy look, the Chatwick sofa can be a stunning addition to your living room. Its design provides a variety of inspirational classic focal points like pleated roll arms and nailhead trim and also features more modern touches like tapered feet. Plus, the cushions are encased in a down blend and 4 down-blend accent pillows are included for indulgent comfort. Whether you’re a traditionalist or love a trendy look, the Chatwick sofa can be a stunning addition to your living room. 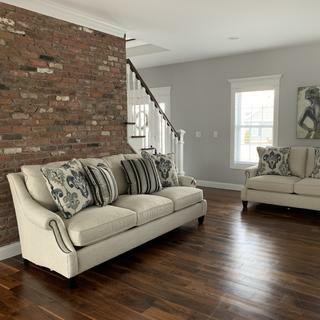 Its design provides a variety of inspirational classic focal points like pleated roll arms and nailhead trim and also features more modern touches like tapered feet. Plus, the cushions are encased in a down blend and 4 down-blend accent pillows are included for indulgent comfort. Frame Height w/o Pillows: 35.5"
Inside Arm to Arm: 83"
Woven blend of 35% acrylic, 30% cotton, 20% linen and 15% polyester. Frame joints are reinforced with dowels, screws and glue for added strength and stability. I bought two of these couches for my large living room. My whole color scheme are various grays and metallics with accents of teal and blue-greens, with medium dark harwood floors and original medium reddish brown wooden beamed ceiling in an 1847 farm house. 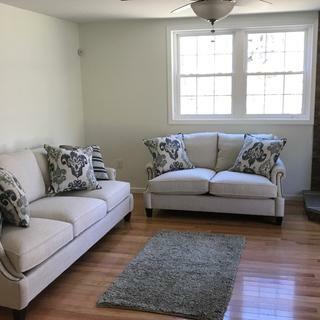 While these couches are more on the off white side (they very much remind me of a linen fabric without being scratchy) they go completely with the color scheme. I was searching high and low for something not too antique looking and not too "new." The nail head detail on the front is just enough, making this couch feel elegant but also between something too traditional and something contemporary. Really it's the PERFECT couch, as it is also deep and comfortably fits four people or more per couch being so long. It looks like this couch is more high end / expensive than it is and the quality is very good. Wishing it as available in other colors and giving it less stars like one of the reviewers is personal taste - not actually fact based about this piece. We actually purchased this couch due in part of our other couch broke and the platinum insurance plan paid us for the old couch and gave us full store credit towards anything in the store. Needless to say, great plan and I highly recommend getting it. For the cost of the plan versus the price of the couch, you can't beat it. This couch is far better than our last purchase in many ways. First and foremost the material is great. It is textured but not rough, our last one pilled like no other and the texture was similar. This couch also is wider, in fact, I walked around the store and didn't find another non-sectional that was wider. We have a small living room and sometimes entertain, the couch seating 4 people comfortably is definitely a plus. This couch is deep, which makes sprawling out on it with your significant other easy and comfortable. I don't worry about anyone falling off the couch. 4. removable pillow back - need more room? sure! 6. high quality - this thing just shouts high quality. Materials, the fact that it does not have a center support and is a wide couch means they spent some money on the frame. It is sturdy and heavy, this should last a long time... and if it doesn't? Well, we have the platinum plan. 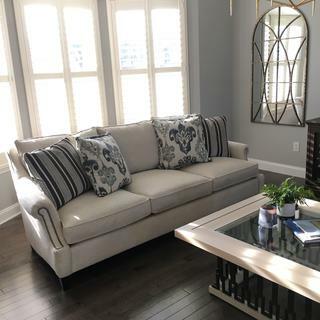 1. price - this is similar to our old couch but twice the price, a bit more than I wanted to spend but being that the other couch it replaced was paid for it made it an easier pill to swallow, plus the quality of this couch is far superior over the old couch. I am glad we chose to make the upgrade for the above reasons instead of just replacing our old couch for its stocked replacement. I definitely think we will get more life out of this one and look forward to many years with it. This is a great, sturdy piece of furniture. It is comfortable although I am not crazy about the material & wish it was offered in additional colors. So far I am very happy with this couch. The fabric seems like it will hold up well. The length is good for seating and napping. The style works well in the family room even though it would also work in a more formal space. I am completely satisfied with this purchase. The sofa is absolutely gorgeous and so comfortable. It feels very sturdy, though I've only owned it for a month. I love ?? this sofa! Originally I did not want to spend this much on a sofa. Sofas at half the price just do not compare to the quality of Bernhardt furniture. The interest free financing makes it a no brainer. I felt sorry for the sales person, I looked at so many sofas, narrowed down to two, both Bernhardt. Finally decided on this one, and I could not be happier with my choice. I like the length and the fact that there’s is not middle leg support tells you the quality workmanship. I have had this for 6 months now, the fabric shows no pilling or other signs of wear. It is so very comfortable too. Spend the money on quality, you will not be sorry. Very comfortable deep seated perfect for a formal living room or a more casual setting. I am in love with this sofa! Pillows are so cozy! Set up and service was neat, easy and professional!! Super comfy and great looking couch. For the time being we are going to keep the pillows that come with the couch and loveseat. It has hints and undertones of green. However one can easily pair warm colored accents with this set. It has a pretty deep seating yet it doesn’t look sloppy. The Chadwick sofa is extremely comfortable and the material is very durable even from cats. Love my sofa and chair...looks awesome in my living room ! This sofa is beautiful and functional. The color is perfect and the accent pillows are perfect match to show off the sofa. My husband and I actually purchased the whole set for our living room and we love it??! You really do get what you pay for! After returning a moderately priced sofa and live seat that was damaged -we opted to upgrade to a more expensive couch and love seat and we are thrilled! The sofa is solidly constructed, beautiful, comfortable and was a great investment. Thank you for working with us to find the perfect fit! Thank you Ray for the outstanding customer service. You rock my brother. The set looks gorgeous in our living room. Perfect size perfect match. This sofa is long and lovely! It’s plush and the neutral color is easy to decorate around with other pieces. I am very pleased with my new sofa. Kimberly was very helpful. Delivery was prompt, and I will recommend Raymour & Flanigan to anyone interested in purchasing furniture. Thank you for fine service. This couch is great. It looks awesome in my room! The staff were so helpful with room planning and helping put together the vision for our space. It’s comfy too ! We love it even more at home. High quality always with Bernhardt! The nailhead trim is a nice added detail. Like the style, color and comfort. Delivery was fast and efficient. Very pretty couch. Comfortable and neutral. We also got the protection plan... with 4 kids, that is a must! Love the Chatwick. It is sturdy and very eye-appealing! It's transitional lines and heavy fabric are a plus. Great to look at...not to lay on!! Overall, I love the couch for its look and feel! It is a well mafe piece of furniture and the fabric is great quality. All that said, we bought for our living room to be our “comfy” couches to watch tv on etc. They are great to sit on...deep firm seating. However...they are too firm to lay on for any extended time - like watch a movie!! I hope they soften up over time although we have had over a month and they are still as firm as when we received. The one in the show room was definitely softer! Therefore I am giving three stars for look and quality but not for confit!! I bought the sofa and loveseat about one year ago. Cushions went flat after a couple months and now loveseat on the sides of has a small bulge because the stuffing is coming down and gathering right in the middle. Call platinum and they are to willing to swap it for a whole different one, which doesn't make sense. They also offered giving me credit for the sofa since its been used, so pretty much I would lose out with that. There is no winning. This is my second set of furniture I had to change because of the poor quality. So having the platinum protection is really not beneficial. I can see if it was damaged because I caused it, but when you have poor quality furniture, you're pretty much stuck with them. I also bought a bedroom set from them and that too started cracking after a couple of months. They came to repair it with some putty and paint...I am so disgusted with their products, that I will never buy another piece of furniture from them. I am looking to write to the BBB and the Attorney General, and possibly calling the media on your side. Because what I really want is my money back! BEST ANSWER: We stock the sofa with the pillows as pictured for immediate delivery. Other fabric choices are available to special order and can be viewed exclusively through your local Raymour & Flanigan store. BEST ANSWER: Yes. There are flame retardants used with this sofa. Can the legs on sofa & chair be changed. What color are nail heads? BEST ANSWER: The legs are not able to be changed. The nailhead trim is actually a silver color. How can I order four of the cream with blue accent pillows? BEST ANSWER: Additional pillows are available to special order and can be handled exclusively through your local Raymour & Flanigan store. How easy is it to keep the fabric clean? What is the best way to clean it? Spot clean using a mild water-free solvent or dry cleaning product, avoiding those which contain carbon tetrachloride as it is highly toxic. Pretest a small area before proceeding. are cushions reversible? Since it is such a light color, do you suggest scotch guard on this type of fabric? BEST ANSWER: The Chatwick Sofa includes reversible seat and back cushions. We do not recommend using any chemical protectants such as Scotch Guard. Often, these chemicals can be harmful and damage the fabric. You may wish to consider our more comprehensive Platinum Protection Plan. This would protect the sofa against any in home accidental damage, including rips, tears, stains and spills. Can this sofa be ordered as a sleeper sofa? BEST ANSWER: Although we do not have the Chatwick stocked as a sleeper sofa, you may contact a showroom directly to see if it could be special ordered as a sleeper as the special order option is exclusive to our showrooms. A sales professional at the store can provide more details. BEST ANSWER: THE Chatwick collection is made by Bernhardt Furniture.